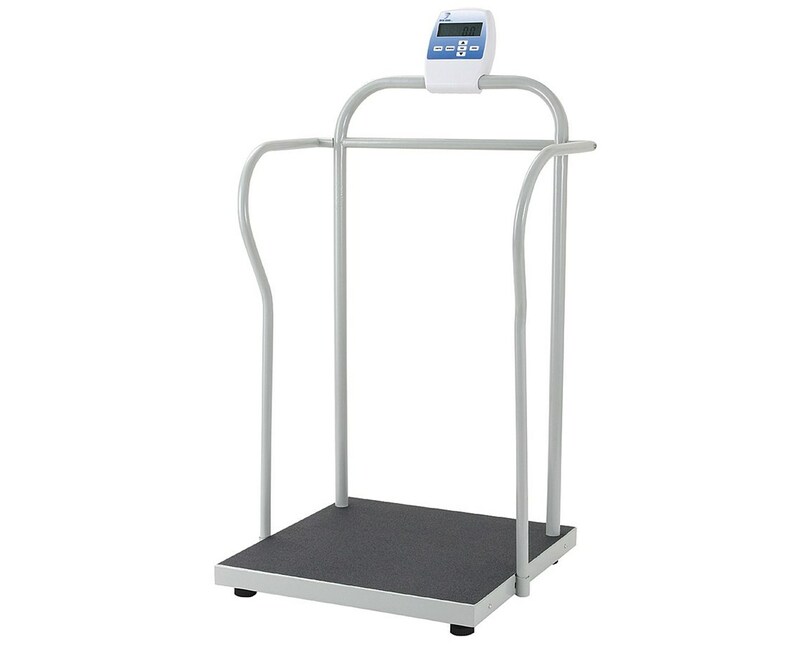 Doran's portable, sturdy, accurate handrail scale is designed to accommodate the majority of patients for easy, reliable weighing. It features a durably constructed, welded steel handrail strategically placed for comfortable, supportive use in patients with difficulty standing. Its extra-large, low-profile, nonslip weighing platform with large foot pads allows simple weighing of patients up to 800 pounds. 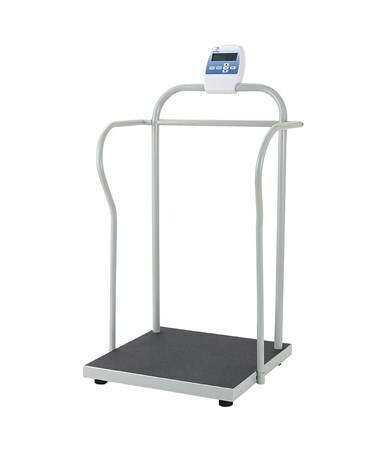 The handrail scale is ideal for patients with mobility difficulties. The platform is set low to the ground for easy stepping up, while the built-in handrail allows the patient to hold him or herself securely during weighing. Its innovative Reweigh feature calculates a second weight while the patient remains on the platform for accurate readings even in unsteady patients. The heavy-duty device is surprisingly easy to move, providing room-to-room portability for added convenience. When tilted, the scale rolls smoothly on its two built-in wheels. The scale calculates patient weight in pounds or kilograms, accurate to the 0.5 pounds or 0.2 kilogram. It displays the reading, as well as patient BMI (with height input in feet/inches or centimeters), on the integrated 1" LCD screen. Its RS-232 and Ethernet ports allow for recording and importing of patient weights and BMI values into an Excel spreadsheet (with Excelerator software, sold separately) or directly to a printer or EMR system. The device is powered by the included AC adapter or 6 AA batteries. Platform 24" x 24" x 3"
Overall Measurements 26" x 24" x 50"
Accuracy + / - 0.5 lbs. Weight Limit 800 lbs. x 0.5 lbs.